We’d love your help. 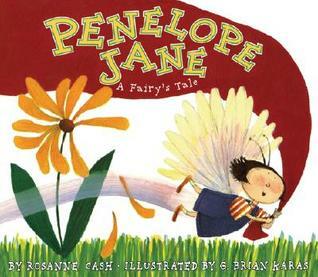 Let us know what’s wrong with this preview of Penelope Jane by Rosanne Cash. Tall as an eyelash, quick as a plane was the tiniest fairy, Penelope Jane. Penelope Jane de la Fesser, a flying French fairy, is just the perfect size to live in the right-hand dresser drawer of her very best friend, five-year-old Carrie. 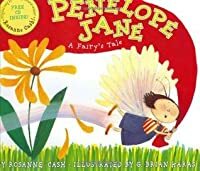 When this eyelash-tall fairy decides one day to go to school with Carrie, she doesn't let her tiny size stand in the way of getting into Tall as an eyelash, quick as a plane was the tiniest fairy, Penelope Jane. Penelope Jane de la Fesser, a flying French fairy, is just the perfect size to live in the right-hand dresser drawer of her very best friend, five-year-old Carrie. When this eyelash-tall fairy decides one day to go to school with Carrie, she doesn't let her tiny size stand in the way of getting into some really big trouble! But when the whole school is suddenly in danger, Penelope Jane musters a lion's share of courage in order to save the day. To ask other readers questions about Penelope Jane, please sign up. I did like this book and can see it fitting well into an Early Years setting. The book has a good, interesting rhythm but unfortunately the rhyming isn't as good as it could be. An example of this is the name 'Carrie' is rhymed with words such as 'fairy' which, in my opinion, isn't the best example one could give to children who are in the early stages of language acquisition and rhyme understanding. The illustrations in this book are beautiful and the centre page folds out into an A3 page which would be wonderful to show children during guided reading. The drawings are captivating and perfect for Early Years, bursting with colour and so busy with characters. It introduces the fantasy genre very well and could be extended into other areas of the curriculum through exploration of fairies. In addition to this, in a nursery setting you could set up a play station where children can dress up in fairy costumes and sing songs like Penelope Jane. At the end of the book there is a page containing Penelope Jane's fairy song with lyrics as well as fairy facts about her which extends the book very nicely. It opens the book up for open and closed questioning which will further the child's comprehension of the book itself. This book is about a small, young fairy, named Jane. She is kind of a trouble maker. She late to fairy class. And when she goes to human class with her friend, she messes everything up. While she is sitting in the corner, a magnifying glass is creating a fire. So she uses her brain and she finds a way to pull the fire alarm, saving the whole school. I don’t like this book very much because my sister would always want me to read it to her when I was a child. And at the end there is a song, and I w This book is about a small, young fairy, named Jane. She is kind of a trouble maker. She late to fairy class. And when she goes to human class with her friend, she messes everything up. While she is sitting in the corner, a magnifying glass is creating a fire. So she uses her brain and she finds a way to pull the fire alarm, saving the whole school. I don’t like this book very much because my sister would always want me to read it to her when I was a child. And at the end there is a song, and I would always have to sing it to her. The pictures are too cartoonish for me. And I don’t really like the story line. I wouldn’t ever introduce this book to my children. I am done with it.  It teaches children to be crazy, and that it’s okay to be crazy, as long as you are brave as well. It’s not the best lesson to teach little children. Wonder what happened to the CD from this library copy. Picked up because it is illustrated by G. Brian Karas, one of my favorite artists. Didn't realize who author was until after I finished and there was song at back. Basic rhyming text sounded ok out loud. A good jumping off point for making little fairy rooms and fairy dolls. Cash married country music singer-songwriter Rodney Crowell in 1979. They have three daughters: Caitlin, Chelsea and Carrie. They divorced in 1992. She married her second husband, John Leventhal, in 1995, and they h Roseanne Cash is a four time Grammy award winning American singer-songwriter and author. She is the eldest daughter of country music icon Johnny Cash and his first wife, Vivian Liberto.